"WHEN YOU GO to FIFA 18, you can choose Lyle as one of your players . . .it shows that dreams can come true", opined Discovery's Head of Vitality Wellness, Dr Craig Nossel, alluding to a playstation game having included Orlando Pirates' teenage striker, Lyle Foster on its roster, [and who was present as part of the panel] at the launch of the 15th edition of the Discovery Walter Sisulu Soccer Challenge, at the Nike Football Training Centre in Klipspruit, Soweto. Hands on the deck. 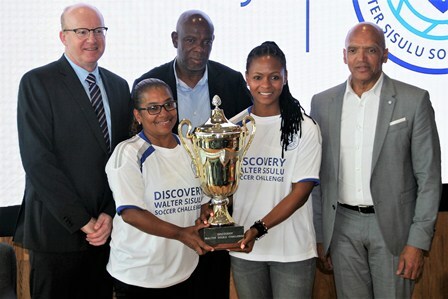 SAFA CE Dennis Mumble, Phil Mogodi, Banyana interim coach Desiree Ellis, Amanda Dlamini and Discovery’s Dr Craig Nossel at the 15th edition of the Walter Sisulu Games Discovery Challenge media launch, held at Nike Stadium- Klipspruit, Soweto. All images JACOB MAWELA. By making mention of Noordgesig raised Foster, who has experienced what he describes as a crazy expedite from playing in the self-same tourney to signing a professional contract with a household PSL outfit in less than a year – the former Baragwanath Hospital medico seek to highlight the importance of the tournament in the growth and development of youngsters and the bringing together of communities. Moving along, Nossel also quoted Madiba on the role football played in motivating prisoners on Robben Island. Smitten with Foster’s ascendancy, the bespectacled executive didn’t have any qualms about letting the gathering know that at the immediate opportune moment, he was going to have a picture taken with the 17 year old marksman- for the benefit of his own teenage sons. With a programme directed by the metrosexual Andile Ncube, the launch was also graced by the presence of yesteryear stars such as Moroka Swallows Ltd’s Joel ”Ace” Mnini, Wits University’s Mike “Nanana” Ntombela and the Orlando Pirates duo of Mandla ”Metroblitz” Sithole and Johannes ”Skipper’‘ Khomane – who were also called upon to assist with the draw. Bafana Bafana captain, Thulani Hlatshwayo [himself a product of the tournament], Foster and the duo of erstwhile Banyana Banyana captains, Desiree Ellis and Amanda Dlamini comprised a panel which partook in a fireside chat over a range of issues, with Ncube. SAFA CEO, Dennis Mumble, also present, again used the platform to expound on his organisation’s Vision 2022 and touched on football’s need for Discovery’s sponsorship for the next 15 years to come. ”We are not gonna brag in 2018, unfortunately!”, he offered, alluding to Bafana Bafana’s failure to qualify for the Russian World Cup. Pending the panel engagement, Banyana Banyana interim coach, Desiree Ellis pointed out to how it was amazing that the women’s senior team qualified for back-to-back Olympics considering that there’s no women’s league. Addressing the local propensity to showboating and dribbling, Dlamini, for her part, encouraged the participating women to treat the tournament with respect whilst having fun with a purpose. Hlatshwayo advised young players to work hard and listen to parents- Foster revealed how he thought that he’d be back again participating in the competition and regarding how life has moved rapidly for him. PSL and Orlando Pirates FC chairman, Irvin Khoza, had evidently made a game-changing proposition on the young man’s career trajectory! Host, Phil Mogodi of the Soweto Football Association, who, together with the late Tshepo Sekese had initially approached the Sisulu family with the view of founding a social responsibility vehicle in Isithwalandwe’s name – described the venue of launch as well as where the tournament will be played at, the Nike Football Training Centre in Klipspruit, as the best on the southern hemisphere. He further exhorted the media fraternity to give coverage of the grassroots soccer scene. 2017 marks the 15th year of the Discovery Walter Sisulu Soccer Challenge. The iconic community talent identification tournament has become a breeding ground for discovering the country’s next big stars. Fans from all over Gauteng are anticipating yet another exciting year of the finest and most skillful talent in their community as football fever hits the playing grounds in Soweto. The Discovery Walter Sisulu Soccer Challenge aims to inspire greatness by providing exposure and a platform to identify as well as groom the country’s most promising football talent. This festive season showpiece will see 104 teams challenge for the championship. The teams are split into three categories; 56 teams will compete in the main category, 32 teams in the under 17 category and 16 teams in the women’s category. ”The Discovery Walter Sisulu Soccer Challenge plays an important role in developing soccer in our country. We use the opportunity to encourage and create awareness within the community about living healthier and more active lives. Sport goes hand in hand with physical activity, healthy living and overall well-being of a person. Discovery is proud to be sponsoring an event that has become an institution in Soweto and something the community looks forward to every year, further expounded Dr Nossel. Having played in the Discovery Walter Sisulu Soccer Challenge, Hlatshwayo echoed Nossel’s words by expressing gratitude over the tournaments ability to uplift footballers in communities. In the thick of things. 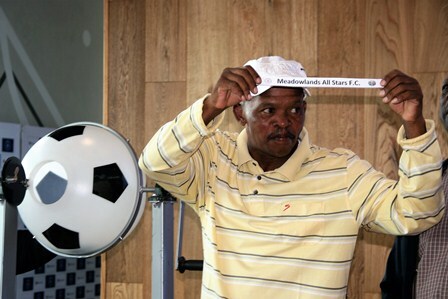 Former Moroka Swallows troublemaker Joel “Ace Mkhuthuzi” Mnini was part of the draw. ”I played in the Walter Sisulu Challenge and it contributed immensely to my career. I know that most of the players who played here and the community look forward to this tournament. The tournament creates a lot of hype and excitement for football lovers. I look forward to witnessing the skills on display this year, said the Bidvest Wits skipper. ”It is amazing that the Discovery Walter Sisulu Soccer Challenge has only existed for 15 years. So much talent has been identified in such a short period of time. This tournament is more than just entertainment for the community; it also gives hope to the people of Soweto as it is backed by a brand that believes in this tournament and its importance. I am looking forward to the development of more players in this year’s tournament and I would like to encourage spectators to come out in their numbers and enjoy community diski”, concluded Mogodi. Once again the Soweto based tournament will lighten up the Gauteng province and entertain spectators throughout the festive season, from the 1st to the 29th of December. One Response to "Discovery Soccer Challenge kicks off in Soweto"